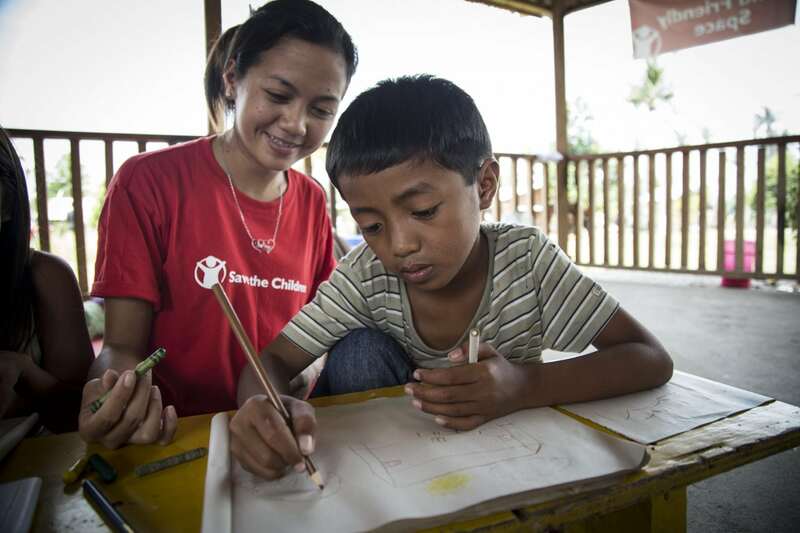 Gerald, nine, attends a Save the Children Child Friendly Space, Leyte province, Philippines Gerald survived Typhoon Haiyan on 8 November 2013. He encouraged his family to evacuate their home and go to a nearby school, where they sheltered as the typhoon destroyed the area around them. When they returned home, they found their house had been destroyed along with their fishing boat. Save the Children has given Geraldâs family various items to help restore their home, including tarpaulins, a hygiene kit and an emergency toilet, as well as cash to buy supplies they need. Save the Children is repairing classrooms and hygiene at Geraldâs primary school. He is a member of the WASH Club and helps to promote hygiene in their school and community. His older siblings Shirley Mae and Frederico are enrolled in our vocational skills development programme. Shirley Mae is learning dress-making and Frederico electrical installation.